This past Saturday was fiance's cousin's wedding -- the wedding that we found out about just a few months ago, even though they are first cousins by blood relation. 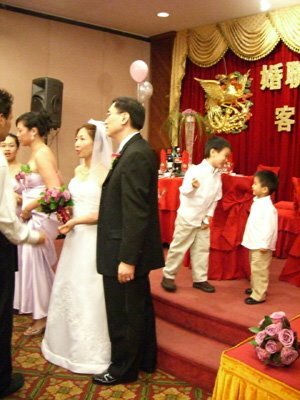 Prior to this whole getting married thing I really never paid attention to the traditional (aka FOB) Chinese wedding b/c I always found them lame, silly, cheesy, and a bit boring. This one was about the same but I got a totally different perspective b/c all the siblings, who should have sat at the head table with the bride and groom, refused. Their excuses were that their kids would disrupt the proceedings (more reason for me to prepare packages to keep them entertained and fed) so me and fiance, along with his parents and brother were moved to the head table. I thought this quite inappropriate since we are not considered as important as the siblings, yet we were treated a lot better. But I can't complain b/c this was my first time sitting at the head table and the service was 10x better than it is otherwise. There was one waiter who was dressed nicer than the other waitstaff who tended to just the top two tables on the stage. We all had gold-rimmed chargers where they placed each new plate of food on. Normally they would probably change your plate after a few courses but they changed it for us for each new course. Most of our courses arrived in some dramatic (i.e. tacky) fashion. For instance, the first course, lobster salad (with way too much mayo), arrived with smoke rising through a bowl of dry ice, disguised with flowers on the side. The fish course (overcooked of course) arrived on a silver (chrome?) stamped stand, the soup came in a giant gold tureen (instead of the usual ceramic ones). The rest of the tables just got regular stuff without all the fanfare. Of course all this fanciness didn't prevent them from serving the (dry) cake on paper plates with plastic forks at the very end. Like most traditional Chinese weddings, they played various games like blindfolding the bride and having her guess which one is her husband by feeling the calves of various men, seeing how long bride and groom can kiss (cheesy b/c they just stood there with their lips touching for the duration of a sappy love song), weird cake cutting/eating, carrying the bride around the room and having the bridal party follow suit (groomsmen carry bridesmaids). Thank goodness they didn't play more risque games like moving an egg from one pant leg to the other. But all this was lost on me b/c I could barely see what was happening from the stage (the stage is behind the dance floor, where all the action takes place). So while we were treated very well with the food, we didn't have such great views of what was going on. For the most part, I didn't really care, especially when it came to the bouquet toss b/c no one tried to pull anyone from the stage (whew! my last chance at ever being forced to do that). How they strayed from the traditional (which I think is a major faux pas) was the introduction of the family. Usually the MC goes down a list of both the bride and groom's relatives, going from the closest relation (parents, siblings) to as far as aunts and cousins. They only introduced the parents at the very beginning when they entered in before the bridal party. No one else was introduced and for all I know, ppl probably thought I was closely related to the groom since I sat at his table. What I liked about the wedding were the flowers, the bride's makeup (though it didn't look so great in my pics), and the bride's second dress (unfortunately I didn't take any pics of that on my camera though). The BM bouquets were all made of opened lavender roses with a collar of broad folded palm leaves and tied with a maroon cloth for the handle. Three colored pins in a row held the fabric in place. The GMs wore the same rose while the groom had a calla lily in a purplish red. The bride's bouquet was composed of the same calla liliy that the groom wore and the same roses that the BMs carried. The parents' boutonnieres were a maroon orchid (about the same color as the groom's lily) and the siblings (boutonnieres are given out to close relatives at Chinese weddings to distinguish them from everyone else) had the same lavender rose as the BMs, but tied with a sheer lavender ribbon into a loopy bow. I liked the flowers b/c they were really fresh-looking and the colors were really vibrant. 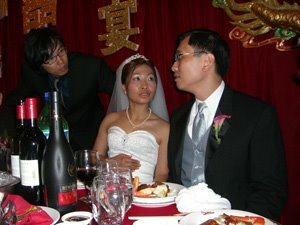 The bride's makeup was also very nice -- subtle (not overdone) with some glitter on her cheeks and decolletage. Her evening gown was a strapless gold dress with a knot detail at the top and at the waist. It fit her perfectly (she said she didn't have to get any alterations) and she looked great in it (unlike her wedding gown, which didn't fit as well). The head table decorations included napkins and chair covers embroidered with the usual phoenix and dragon. There was also a tall floral centerpiece (see below), while all the other tables just had the usual display of liquor and soda. 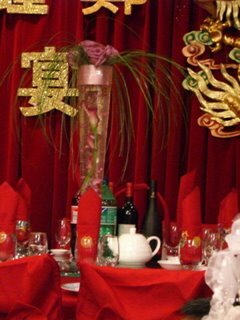 I'm still trying to figure out whether the centerpiece had real flowers in it b/c it looks like the fake gel water in the vase. The roses at the top were definitely real though. The favors were given out at the end as ppl left -- a short, stubby lavender candle in a crimped glass jar, covered with a tulle circle and tied with a ribbon. Another ribbon, with the couple's names and date on it was glued onto the side, as were a few tiny silk flowers. Then, as if it weren't enough, someone decided to glue on pearls to the top of the tulle circle. It was weird and totally useless b/c half the pearls fell off already. Oh well. After getting the favor, The MOH's husband also stopped everyone for a final picture. So ended the third wedding of the year for me. That's one of the worst things that I'm afraid might happen to me when I have my reception...that ppl will sit there wondering why things are the way they are i.e. wedding favours or weird games...esp since my significant other's family is not Chinese. I want the greatness of the food that a Chinese banquet has to offer, but I don't want the tackiness!